The Ganaraska Region Conservation Authority is pleased to announce that cross-country ski and snowshoe equipment is now available to rent through the Ganaraska Forest Centre. 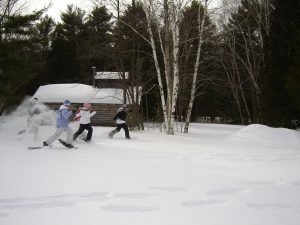 Plan to arrive and finish your ski or snowshoe trek before 2:00 p.m. – All rentals must be returned to the gatehouse or GFC by 2:00 p.m. or subject to loss of deposit. Call ahead for availability and trail conditions. Rentals are available on weekends (10:00 a.m. – 1:00 p.m.) through the gatehouse, and on weekdays (9:00 a.m. – 1:00 p.m.) through the GFC (subject to staff availability). Be prepared to sign a rental and release of liability agreement. After you experience the Ganaraska Forest on a pair of ski or snowshoes, you’ll want to keep coming back to explore!